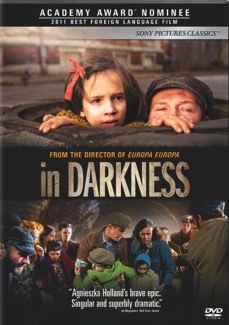 From acclaimed director Agnieszka Holland, In Darkness is based on a true story. Leopold Socha, a sewer worker and petty thief in Lvov, a Nazi occupied city in Poland, one day encounters a group of Jews trying to escape the liquidation of the ghetto. He hides them for money in the labyrinth of the town's sewers beneath the bustling activity of the city above. What starts out as a straightforward and cynical business arrangement turns into something very unexpected: the unlikely alliance between Socha and the Jews as the enterprise seeps deeper into Socha's conscience The film is also an extraordinary story of survival as these men, women and children all try to outwit certain death during 14 months of ever increasing and intense danger. Most of this movie was shot in scenes with little or no lighting. How did the movie use this to move the story forward? What is the symbolism of water in the movie? What other symbols did you notice? Agniezka Holland, the polish-born director, portrays her main characters as real people with ambiguities and internal conflicts. Which character(s) were you most affected by, either positively or negatively? In what ways does this film add (or detract) from our understanding of the Holocaust? How did Wanda's "Jesus was a Jew" comment affect the tenor of the unfolding drama? How does the film explore redemption and the factors that aid or hinder it? In what ways do darkness and light reveal themselves in the story? What scripture passages does this film bring to mind? What did you make of the irony of Passover being celebrated at the same time as the Eucharist overhead? This movie is part of a tradition of Holocaust movies: Schindler’s List, Sophie Scholl, The Boy in the Striped Pajamas, Before The Fall, Defiance. Why do we watch these movies? How do you relate to your own darkness and light? We are all born at some level racist and need to be educated out of this condition. Do you agree? How does the movie support or challenge your position? In relation to 'his' Jews, Socha moves from self-interest to compassionate interestedness. Has this ever happened in your life, or someone you know?